Better to have Camel Arm than cameltoe, but still. This entry was posted in fashion police on December 15, 2007 by admin. 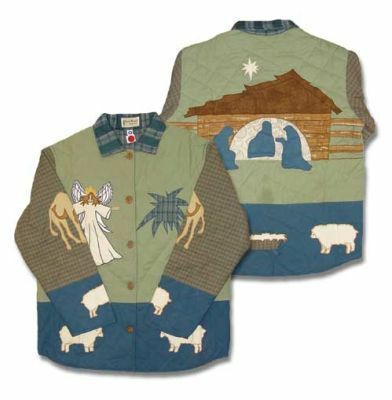 The camel arm shirt goes so well with the “were your born in a barn” nativity. We’ll have to get it for the fiddler. 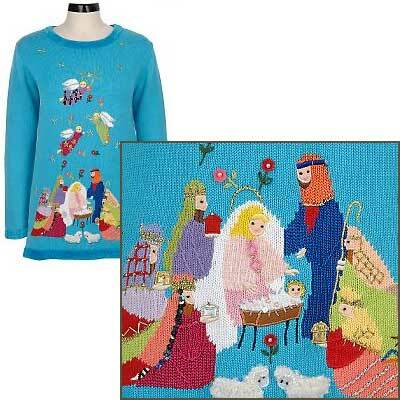 I am wondering why Mary (on the electric blue sweater)appears to be wearing “My Favorite Martian” flower antennea along with her bridal veil? And why is smiling baby JC’s head about to roll off the manger? These are definately targeted for the over 70 set! As I rapidly approach 50, I can reasonably say – if I ever, ever, EVER wear anything like any of these monstrosities, put me out of my misery instantly. Doesn’t matter if I’m 50, 70, 90, or 110. Clearly, I’ve lost my mind. The only possible excuse is if the monstrosity was a gift from deeply-adored grandchildren. In that case, I plead temporary insanity if I wear the monstrosity during their visits. Oh HELLZ yeah I would wear the Camel Arm thingy! And I would straight break it DOWN Fergie style, singing “My Humps” at the top of my voice, laughing maniacally as they dragged me away to a nice quiet place, where there is no such thing as ‘The Little Drummer Boy,’ pa rum pa pum pum . . . .
QVC is all to blame for this Quacker Factory crappola.